E’terra Samara is a five-star eco resort designed by Farrow Partnership studio that consists of twelve treehouse villas sensitively nestled into Canada’s Bruce Peninsula forest, which is listed as a UNESCO World Biosphere Reserve. So as to work in harmony with the dramatic natural landscape, the treehouses are designed to be suspended in such a way that they ‘hug’ the trees, rather than being nailed directly into the lofty, historical arbors. Farrow Partnerships‘s design was inspired by the shape of a samara, a propeller-like seed capsule that falls from maple trees in autumn. Prefabricated off-site, the structures draw upon sailing boat construction techniques to create the smooth, curved shapes from locally-sourced, FSC-certified wood. 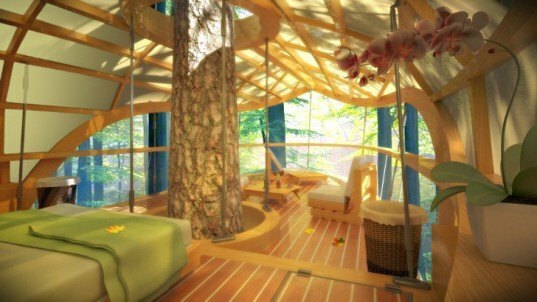 Each treehouse is protected from the elements by a fabric ‘bonnet,’ which is intended to function like the leaves of a tree and will be constructed of PTFE fiberglass-coated non-toxic, flame-resistant, self-cleaning TiO2 (titanium dioxide) fabric. Each one-bedroom treehouse features a sleeping section inside the deepest “fruit” section of the villa, with a socializing section on the outer region of the structure. 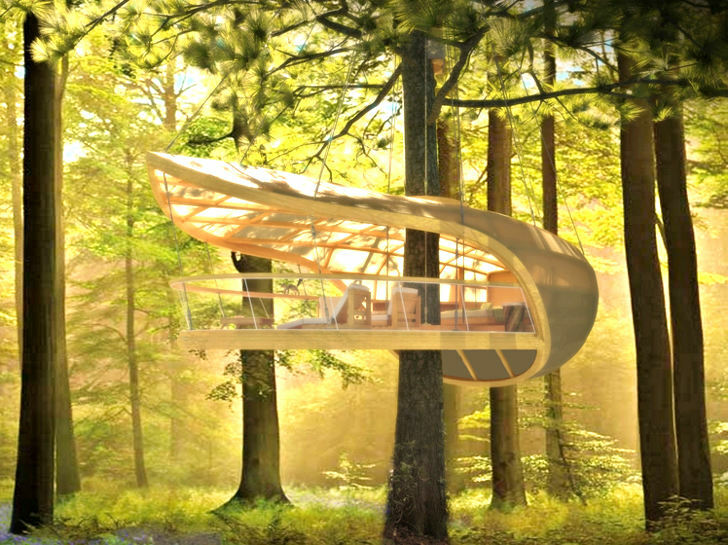 The individual treehouses will additionally be located to take advantage of site-specific features to allow maximum privacy and optimum light. Currently in the design phase, the treehouses will be constructed and installed in the winter months so as to cause minimal disruption to surrounding plants. I would love to spend a few nights here,,,how? E’terra Samara is a five-star eco resort designed by Farrow Partnership studio that consists of twelve treehouse villas sensitively nestled into Canada's Bruce Peninsula forest, which is listed as a UNESCO World Biosphere Reserve. So as to work in harmony with the dramatic natural landscape, the treehouses are designed to be suspended in such a way that they 'hug' the trees, rather than being nailed directly into the lofty, historical arbors.